The cloud has brought both risk and reward to MSPs. In today’s hybrid cloud world, MSPs must deliver consumption-based, private and public cloud offerings to their clients. This includes offering primary storage, offsite backup and DR that is high-performance, scalable and secure. Outsourcing primary storage along with backup and DR enables an MSP’s customers to reduce their on-premises footprint software licenses, connectivity and the problems that come with it. It also sets up the MSP to offer hybrid services like DR as a Service and the new opportunity of copy data management - stop making copies. 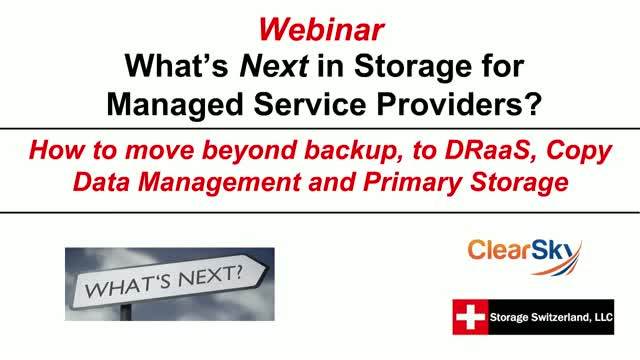 Title: What's Next in Storage for Managed Service Providers?